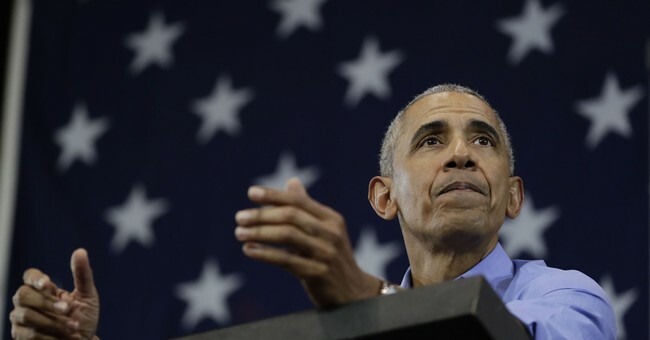 Pittsburgh Synagogue Massacre: Obama Slams 'Hateful Rhetoric' -- Did He Mean Trump's, or His Own? Former President Barack Obama received praise for his response to the recent murder of 11 people at a Pittsburgh synagogue. Obama tweeted: "We grieve for the Americans murdered in Pittsburgh. All of us have to fight the rise of anti-Semitism and hateful rhetoric against those who look, love, or pray differently." Many described Obama's words as a powerful call for "unity." Meanwhile, leaders of Bend the Arc, a Pittsburgh Jewish advocacy group, said President Donald Trump is not welcome in their city until Trump "denounces white nationalism" -- the white supremacist movement that many believe Trump is guilty of either supporting or at least providing aid and comfort. Speaking of "hateful rhetoric," critics of President Trump have apparently forgotten about Obama's 20-year relationship with his anti-Semitic pastor, the Rev. Jeremiah Wright. After 9/11, Wright called the attacks retribution, in part, for America's support of Israel. In a 2009 interview, Wright said: "Them Jews ain't going to let (Obama) talk to me. ... They will not let him to talk to somebody who calls a spade what it is. ... Ethnic cleansing is going on in Gaza. Ethnic cleansing (by) the Zionist is a sin and a crime against humanity, and they don't want Barack talking like that because that's anti-Israel." Wright and Nation of Islam Minister Louis Farrakhan have long been friends. In 2007, the publication founded by Wright's church, Trumpet Newsmagazine, awarded its annual "Dr. Jeremiah A. Wright Jr. Trumpeter Award" to Farrakhan, a man who, it said, "truly epitomized greatness." Farrakhan, in a February 2018 sermon, proclaimed the era of Jewish influence was near its end. Farrakhan said: "White folks are going down. And Satan is going down. And Farrakhan, by God's grace, has pulled the cover off of that Satanic Jew, and I'm here to say your time is up, your world is through." In 2005, Farrakhan posed with a smiling freshman senator named Barack Obama. Fortunately for Obama, the photograph was not released until after Obama completed his two terms in the White House. Long-time Democrat Alan Dershowitz says that had he known about that photograph, he would not have campaigned for Obama. Obama often denounced cops. Shortly after his election, black Harvard professor Louis Gates -- a friend of Obama's -- couldn't open his front door upon returning home from a trip. Gates asked his driver for assistance. A neighbor, observing two people trying to force open Gates' front door, called 911. The Cambridge, Massachusetts, cops responded, and politely requested that Gates, now inside the house, step outside and prove he lived there. Rather than cooperate, Gates made flippant comments to the cops, escalating the matter. Obama later said, "The Cambridge police acted stupidly." No, they hadn't. In Ferguson, Missouri, Michael Brown, an unarmed black man, was killed by a police officer. A friend and witness claimed that Brown held his hands up and pleaded with the cop, "Don't shoot." A grand jury later found the assertion a lie and completely exonerated the officer. But before the investigation was complete, Obama invoked Ferguson during a United Nations address as an example of the systemic racism blacks allegedly face in our criminal justice system. Obama's Attorney General Eric Holder falsely claimed that due to "pernicious" racism, the "criminal justice system ... treats groups of people differently and punishes them unequally." But the U.S. Sentencing Commission concluded that the longer sentences result from "legitimate factors." The typical black defendant has a longer criminal record than does a white defendant, and during sentencing, judges often consider defendants' criminal records. President Obama, commenting on the 2016 police shootings of unarmed blacks, said: "These are not isolated incidents. They are symptomatic of a broader set of racial disparities that exist in our criminal justice system." But recent studies, including one done by a black Harvard economist, show the opposite. Cops, the studies found, are more hesitant to use deadly force on a black suspect than a white one. In 2014, two NYPD officers were killed -- literally executed -- while sitting in their squad cars. In 2016, five Dallas cops and three Baton Rouge, Louisiana, cops were also killed. All three suspects in these cop killings were black men, motivated, according to their own social media postings, by Black Lives Matter's claim of anti-black systemic racism in the criminal justice system. After the Dallas shootings, William Johnson, the executive director of the National Association of Police Organizations, said, "I think (the Obama administration's) continued appeasement at the federal level with the Department of Justice; their appeasement of violent criminals; their refusal to condemn movements like Black Lives Matter actively calling for the death of police officers ... while blaming police for the problems in this country has led directly to the climate that has made Dallas possible." Trump's critics argue that his alleged "hateful rhetoric" inspired the pipe bomb suspect and the suspected Pittsburgh synagogue shooter. As for the cops murdered in New York, Baton Rouge and Dallas, does the same logic apply to Obama and his anti-cop rhetoric?